abe_froeman wrote: Speaking of Salerno's, I heard they got new owners relatively recently (in the last couple years)...can anyone confirm if they're at least as good as they were before? I think it's still in the Salerno family, but which ones it is may have changed. In any case, the food hasn't changed a bit in recent years. Very consistent, if not the most exciting of Italian food. It's one of the places we walk to with the dog on warm summer evenings to eat at their outside tables, so we're there a few times a year. Mi Restaurante in the same center is also very good -- great table salsa, pretty good carne en su jugo, excellent torta milanesa, etc -- and also has outside tables in the summer. Carlucci, a 15-year fixture in west-suburban Downers Grove, is closing. The last day of service will be Sunday. Signs are up on the windows inside - Bonci is coming. The macaroon/coffee place on Sheffield and Armitage, Sugar Fixe Patisserie was papered over when I walked by this morning, and their web site indicates only an Oak Park location now. 2 coffee shops opened recently in my old neighborhood of Gold Coast. Also, a new restaurant and lounge is coming to the new No. 9 Walton condo building at State & Walton opening in late summer. It will be operated by On the Fly Hospitality who is behind Gemini Bistro and Coda di Volpe. Apparently it will not be terribly expensive, and therefore a little more approachable (I'm guessing that's code for under $30 a plate). First floor will be a 1000 sq ft cocktail bar and the second floor will a 6000 sq ft, 150 seat restaurant with a bar. Appears that Pork Shoppe in Andersonville (5721 N Clark St) has closed. Website is dead and Yelp says they're closed. Too bad since it was a reasonable option with decent BBQ at the north end of Aville next to Gesthemane. Posted this in another thread, but it looks like a place called Sizzling Pot King is open or about to at 769 W Jackson Blvd, just across the bridge from the new H-Mart. Business license was issued yesterday. 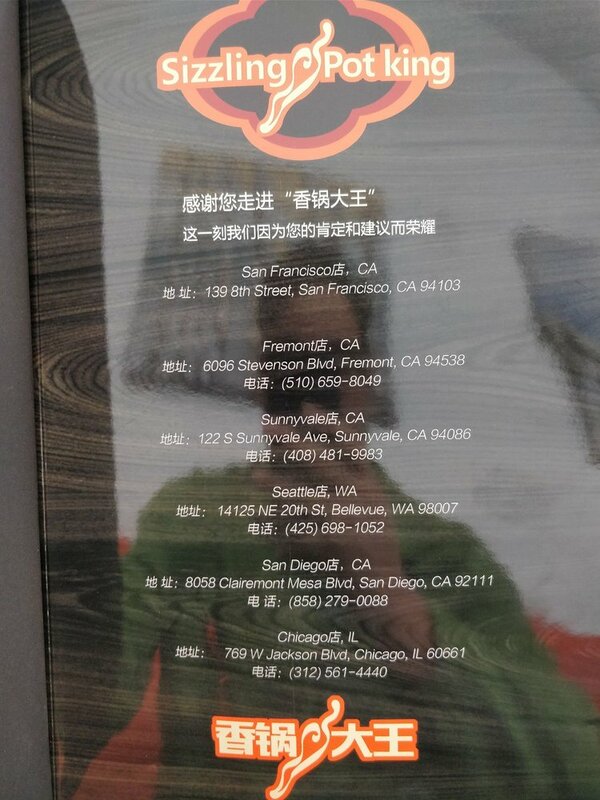 They started in San Diego and have locations also in San Francisco, Sunnyvale, CA (near San Jose), Fremont, CA (also near San Jose), and Seattle. This is a Chinese restaurant dealing with Ma La Xiang Guo (Dry Pot) - a place where you can actually customize what goes in it. Looks like they also serve Hunan Chinese cuisine. I am personally a huge fan of Ma La Xiang Guo and often times prefer it to hot pot. 926 W. Diversey, which has been a couple of pizza places, is now Big & Little Pizza & Poké. In other 3900 block of Lincoln Ave news, the Papa John's at the corner of Lincoln and Larchmont has closed. riddlemay wrote: 926 W. Diversey, which has been a couple of pizza places, is now Big & Little Pizza & Poké. It opened back in early October. In even more 3900 block of North Lincoln Avenue news, Melao Latin Cuisine has been cleared out and papered over with signage indicating a new location of El LLano (which has an outpost at 4011 N Elston and if memory serves me right, previously occupied the Melao space prior to moving to Elston). Both are Columbian fare so not sure if related in business or family. JoelF wrote: 1) Tandoori House at 401 E Euclid, Mount Prospect, which I first reported on in October 2016 has shuttered. That seems to be something of a death spot, especially with all the fast casual ringing Randhurst Village, but I could use a nearby Indian joint. They weren't the fastest service or the most varied menu, but they were decent. That same spot has hosted New Sunrise, Emma's, and Mount Prospect Pancake House since I've been around here. This is now open as La Presa, Mexican. Their website has nothing but address and photos, but the food looks good in the photos. BaLe left quite a while ago. The new place is a Chipotle-style shop with a fairly limited selection (but lots of ways to mix a few ingredients). City Rock, a quick serve Korean restaurant has opened on 2/26 in the Thompson Center’s food court in downtown Chicago loop. Korean food lovers don’t have many options in Downtown Chicago, but a veteran Chicago chef will provide one as soon as this week when he opens a spot inside the Thompson Center’s food court. Andy Lim and his brother, Billy, are opening a quick-serve restaurant called City Rock. Hey, I never said when it became Big & Little Pizza & Poké. After passing by the Glenview Bonchon location, it looked to be open and sporting a full house. Website still says it's closed though, so visitor beware - it could be one of those new-fangled "soft openings" but I thought Korean chicken wing fans in the northern suburbs would like to be informed. Just noticed this oddity opening today in Niles - Izzy's Arcade Bar - a video game bar with a nice but not terribly ambitious beer list, bar food/pizza and unlimited play on 1980's-era video games. According a posting by Uptown Update, GNR In-On-Thai will be re-opening in Uptown in the 4600 block of N Broadway. Former Grace restaurant executive pastry chef Bobby Schaffer will open Lost Larson, his own bakery in Andersonville, this spring. Schaffer plans to open in the former Goddess and the Grocer space, which folded after 14 months. There's a building permit issued for 500 N Milwaukee (Milwaukee & Grand) for that new high rise there for a new restaurant. Owner name and address is for Stax Cafe on Taylor Street. I'm sure we'll hear something soon. A new location of the mini chain City BBQ is coming to a new stand-alone build-out in the Deerbrook Mall parking lot on the north side of the property off of the Lake-Cook entrance. Greek Street Food restaurant Yeero Revolution in Evanston is gone. Evanston Lunch Group™ had a good, if crowded, lunch there in November 2016, when it was still relatively new. AlexG wrote: A new location of the mini chain City BBQ is coming to a new stand-alone build-out in the Deerbrook Mall parking lot on the north side of the property off of the Lake-Cook entrance. The original plan was to have it next to Art Van in the middle of the property, but this spot in the outlot building will be much more visible next to the Jewel. It opens in May and will have outdoor seating. Another location is going to be part of the new Melody Farms property opening late 2018 in Vernon Hills at 60 and 21. 2) The similarly short-lived Salsa & Chips on Montrose at Kimball.